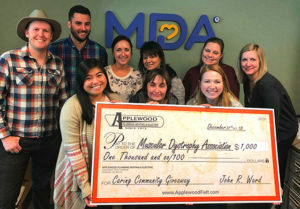 Applewood Plumbing Heating & Electric awarded $1,000 as part of their monthly Caring Community Giveaway to the Muscular Dystrophy Association. Muscular Dystrophy Association, (MDA) is a nonprofit health agency dedicated to curing muscular dystrophy, ALS and related diseases by funding worldwide research. The Association also provides comprehensive health care and support services, advocacy and education. For more than 65 years, the staff at MDA has been committed to saving and improving the lives of kids and adults living with muscular dystrophy and related life-threatening diseases. With care centers across the country, MDA has provided care to over 100,000 children, adults and their families. Locally, MDA Rocky Mountain has care centers at Children’s Hospital Colorado and University of Colorado Hospital and serve over 1,700 families locally who are impacted by muscular dystrophy and related diseases. Each year, MDA Rocky Mountain holds a summer camp in Empire to give children the opportunity to explore the mountains, go swimming, zip-lining, horseback riding and more. Community donations allow MDA Summer Camp to be held at no cost for the families. Additional resources for families seeking assistance include support groups, equipment assistance, flu shots, and more. “With the help of Applewood’s $1,000 Caring Community Giveaway, we can prepare for our annual Muscle Walk held June 8th. We except around 300 participants to join us in our walk this year. All money raised will go towards research and help fund local Care Centers and services,” said Emma Hardwick, Care and Clinical Services Specialist. For more information about Muscular Dystrophy Association visit www.mda.org.